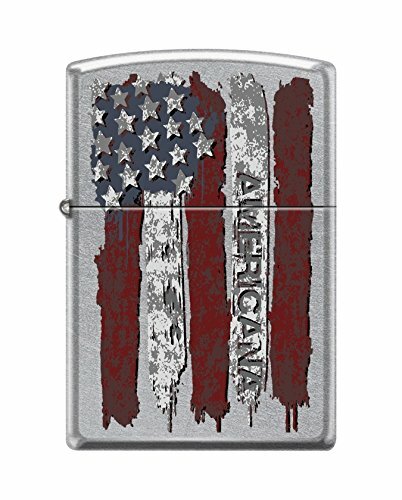 Zippo is one of the most recognized brands in the world. Explore Zippo's new bold and trendy pocket cigarette lighter collection. This cool mini lighters features sturdy construction and wind-proof flame. The classic Zippo windproof lighter is the ideal accessory for camping, concerts, or simply sparking conversation. Classic chrome plated cigarette lighter case is bonded with a micro thin, scratch resistant coating to achieve Zippo's luminous, intense, mirror-like finish. The cool lighter case design are created using Zippo's various imprint methods; color image, laser engrave, and auto engrave. Both the attractive gift box and the cardboard insert are made from renewable materials and are 118% recyclable. The patented 'one box' is attractive, easy to handle, and designed to display more of the mini lighter than ever. Unless otherwise stated, every Zippo windproof car lighter is packaged in the 'one box', designed to address the growing concern over the depletion of our natural resources. With the exception of improvements to the flint wheel and modifications in case finishes, the product remains unchanged and is backed by the company's famous lifetime guarantee. PREMIUM QUALITY: All metal construction. Zippo pocket cigarette lighters are wind resistant, durable, and are extremely reliable. LIFETIME WARRANTY: Refillable for a lifetime of use. Flints are replaceable. Made in the USA "Fix it free" lifetime warranty. If this cool mini zippo lighter ever fails you can return it to Zippo manufacturing for repair--no sales receipt needed. WINDPROOF DESIGN: the vintage car lighter offers a windproof design so that you are never without a flame. PERFECT FOR EVERYDAY USE: Perfect way to start a campfire or BBQ. Keep one in the car, in the tool box, in the emergency kit, on the workbench, in the garage or anywhere a reliable flame lighter might come in handy. IDEAL GIFT FOR HIM: Zippo's Classic Matte cigarette lighter case is suitable for gift giving in its environmentally friendly gift box.